For the past week or so, I have been puzzling over my reactions to a new multimedia project from the Canadian National Film Board. It’s called “Bear 71,” by Jeremy Mendes and Leanne Allison. 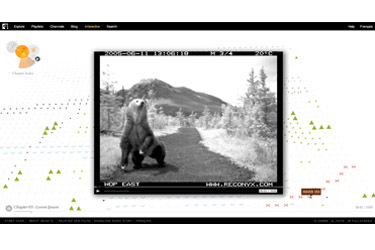 It is described as “an interactive multimedia project” that tells “the true story of a grizzly bear.” It is fascinating. It is absorbing. It is beautiful. It is a high-tech, multi-layered way of spending time with an individual bear. As far as I can tell, nothing is made up. All of the information comes from radio tracking, video, and other sources. The weird thing about it is that it is narrated from the bear’s point of view. Does that mean it is still non-fiction? I’d love to know what other people think, so please watch it, then leave a comment.